Downhill skiing in Japan can often present astounding views. Photo Courtesy of Japan National Tourist Organization. During winter many people throughout Japan enjoy skiing and snowboarding. 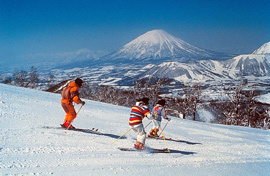 Indeed, in the regions that experience snowy and severely cold winters, such as Hokkaido, Nagano, and the prefectures in Tohoku and Hokuriku areas, skiing, snowboarding, or ice-skating are very popular both recreationally and competitively. In fact, both Sapporo in Hokkaido and Nagano have hosted the Winter Olympics. Many Olympic skiers and skaters are from those regions. Many of them began their careers when they were young children, becoming top national skiers and skaters by the time they were in high school. National competitions of high school skiers and skaters are held annually in some regions that have winter sports. Those competitions can serve as the gateway to successful careers for serious young skiers and skaters. However, figure skaters do not necessarily come from those prefectures with cold winters, since figure skating can be done at indoor skating rinks. Much like the United States, figure skating is a popular television sport in Japan.